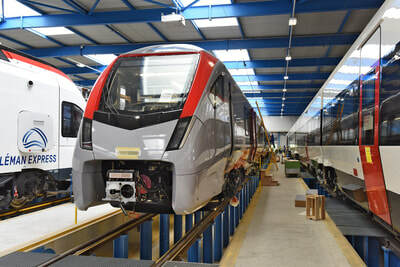 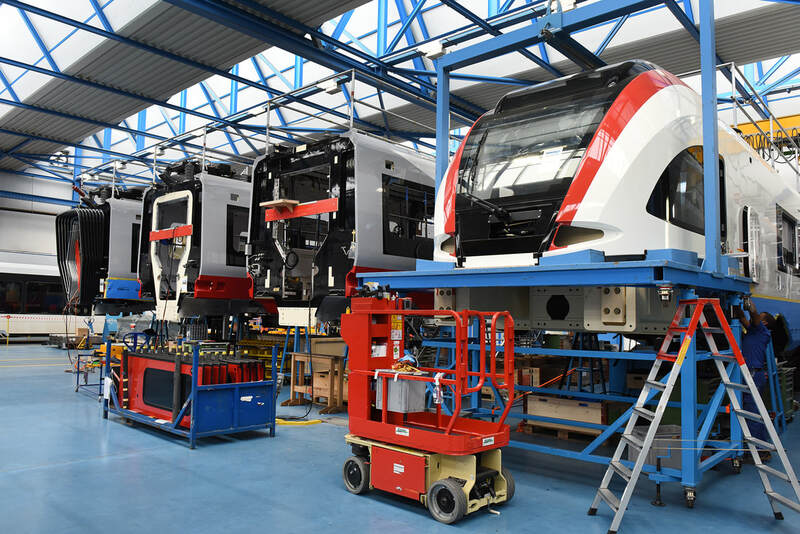 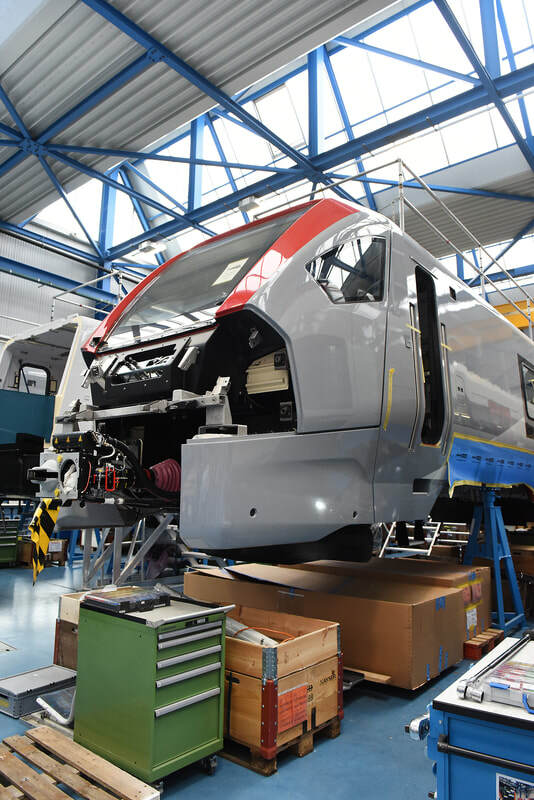 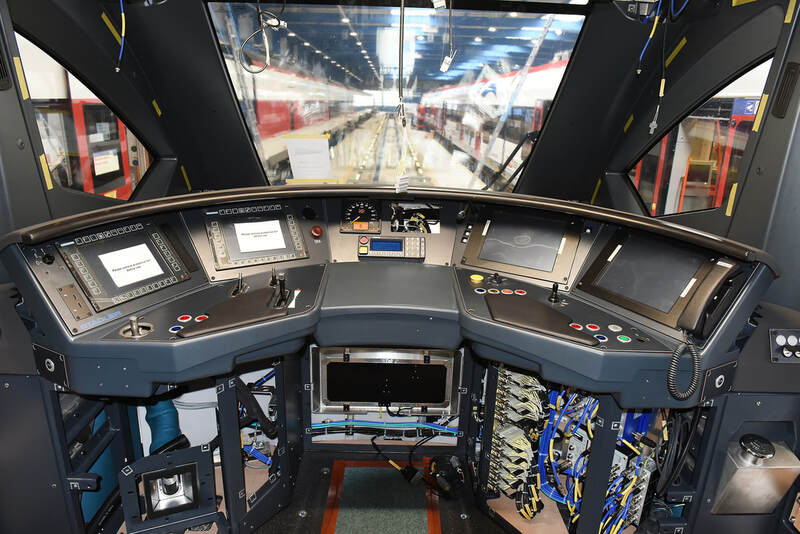 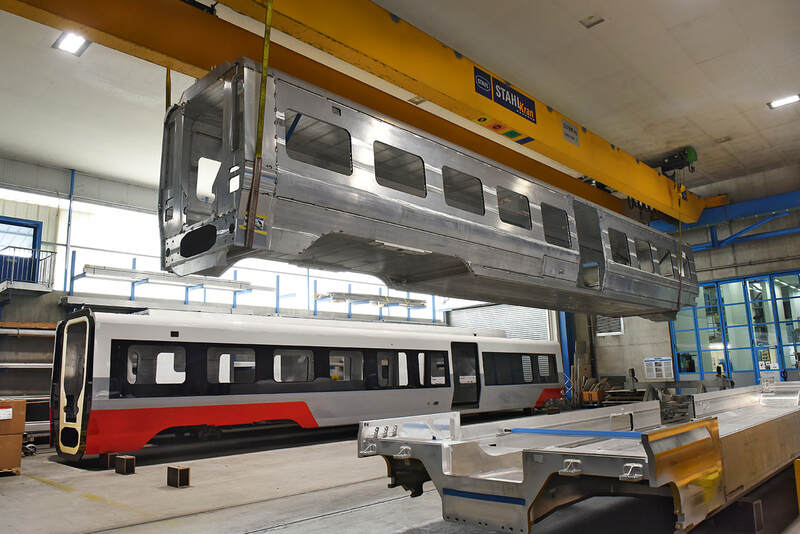 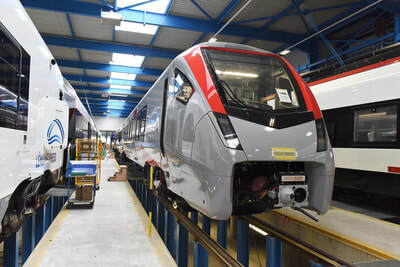 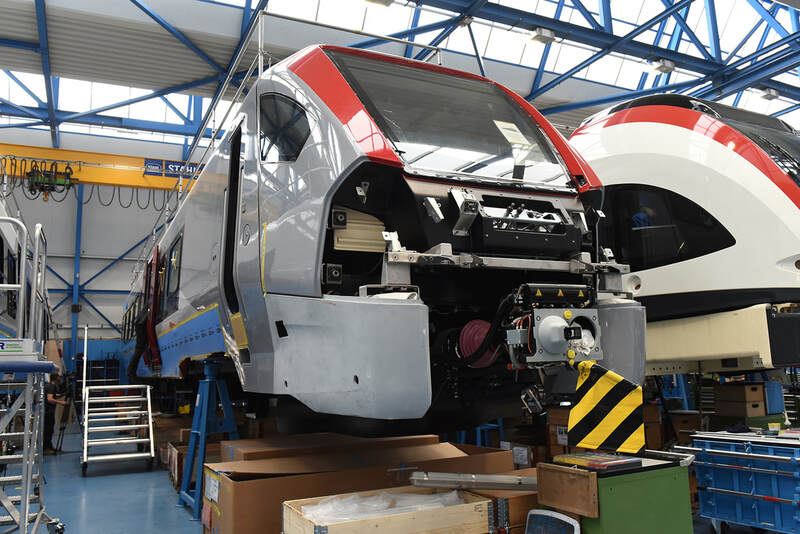 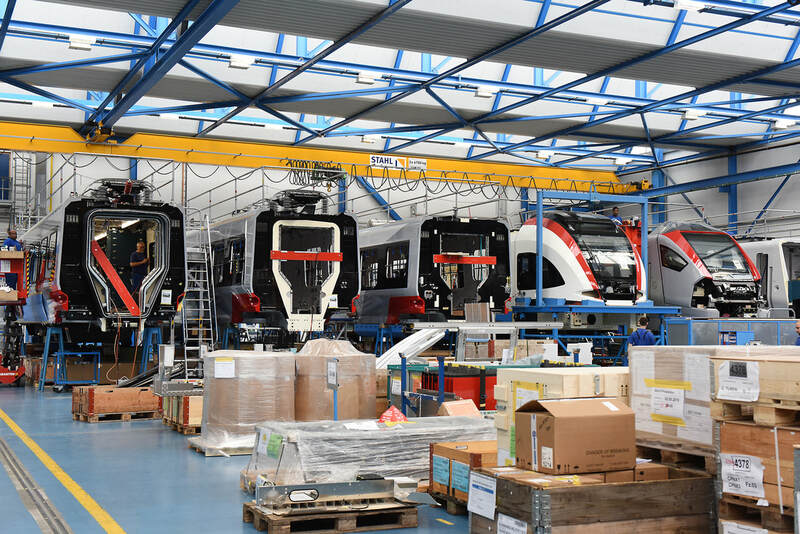 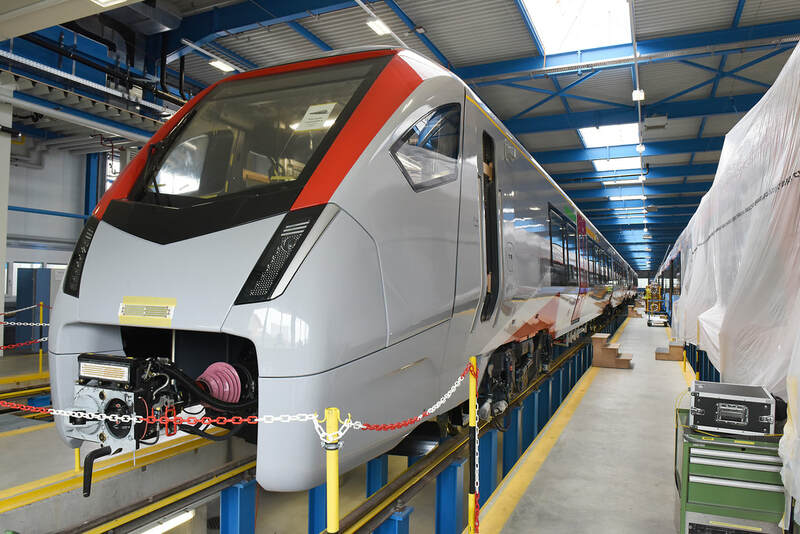 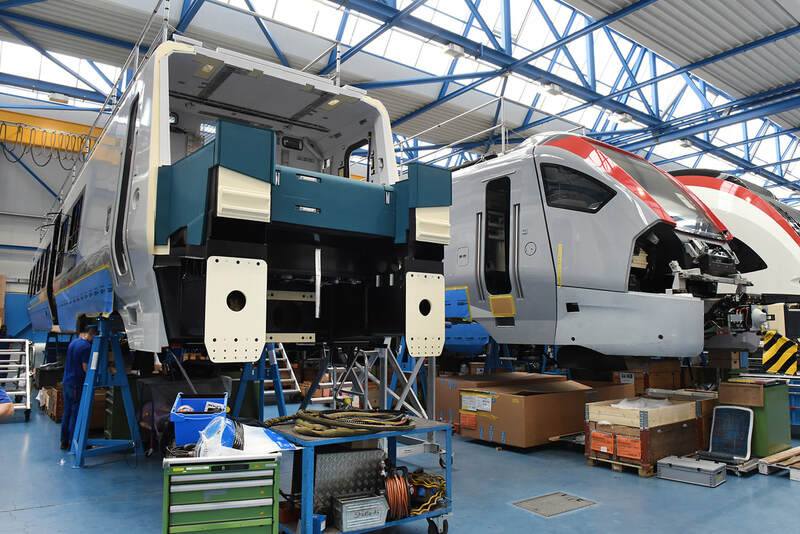 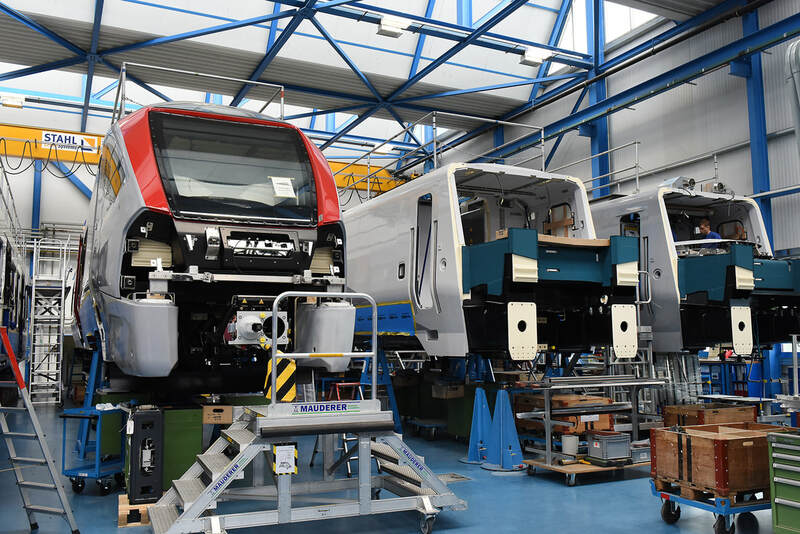 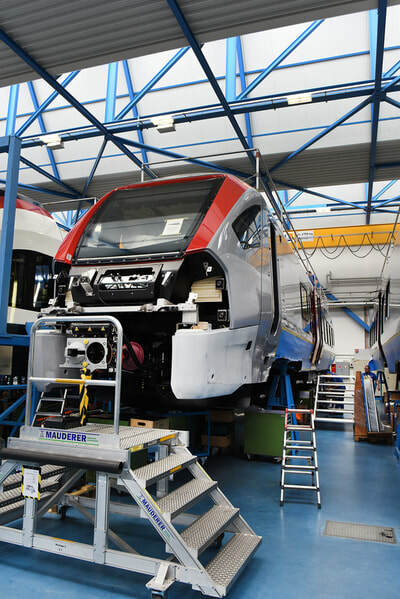 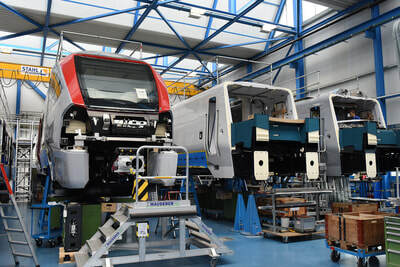 Currently, Stadler are in the process of building four fleets of new trains for Greater Anglia. The 12-car Class 745s are all electric sets. 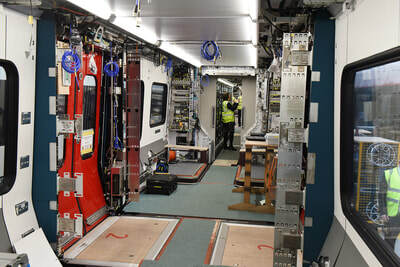 The main line units will seat 757 while the airport sets will seat 767. 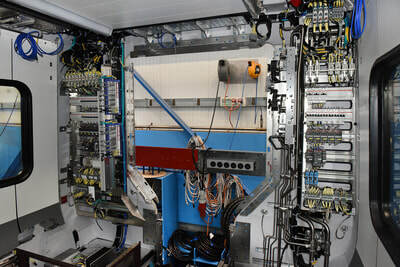 The sets are formed of six two-car semi articulated sections, with driving cabs only at the outer ends of section 1 and 6. 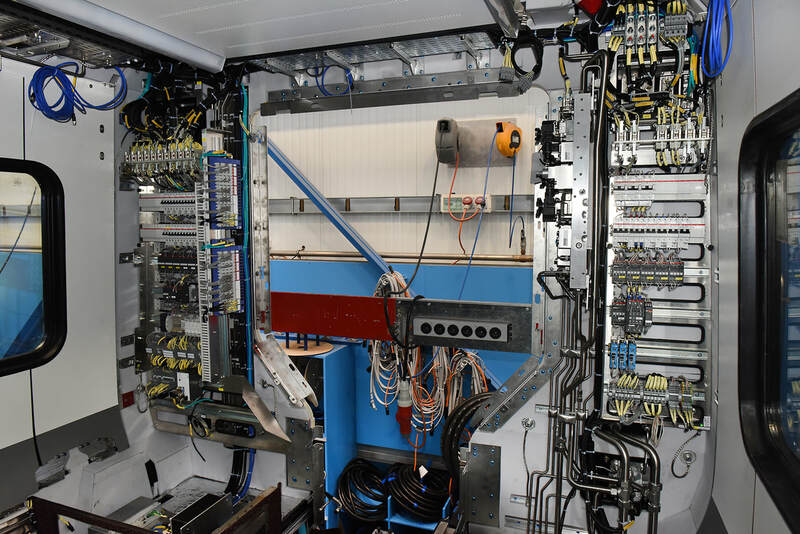 The three and four car BiMode Multiple Units (BMU) can operate from the 25kV ac overhead or from a Power Pack (PP) vehicle coupled behind one of the driving cars. 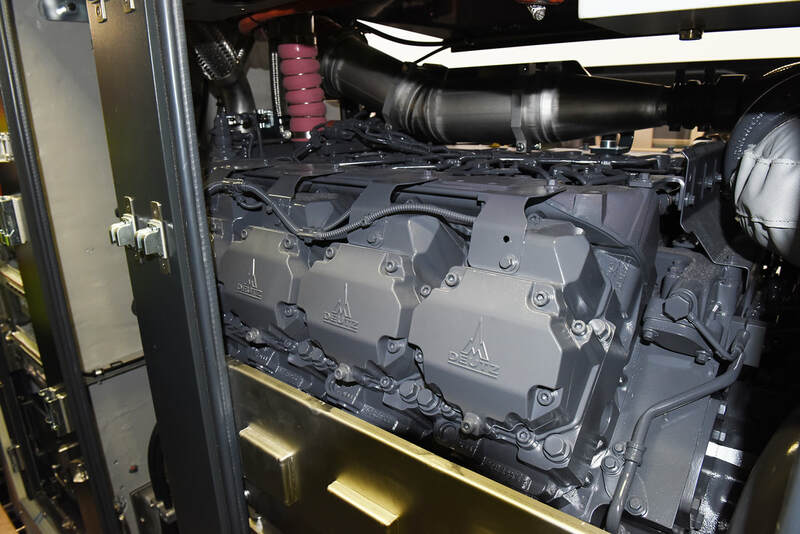 On three car sets this houses two Deutz diesel engines and on four car sets it houses four Deutz engines. 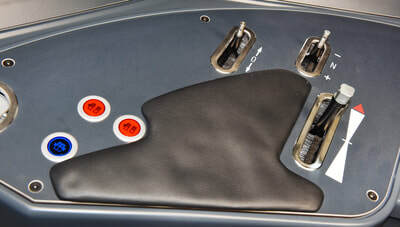 Three car sets will seat 167 and four car sets 207. The sets are articulated. 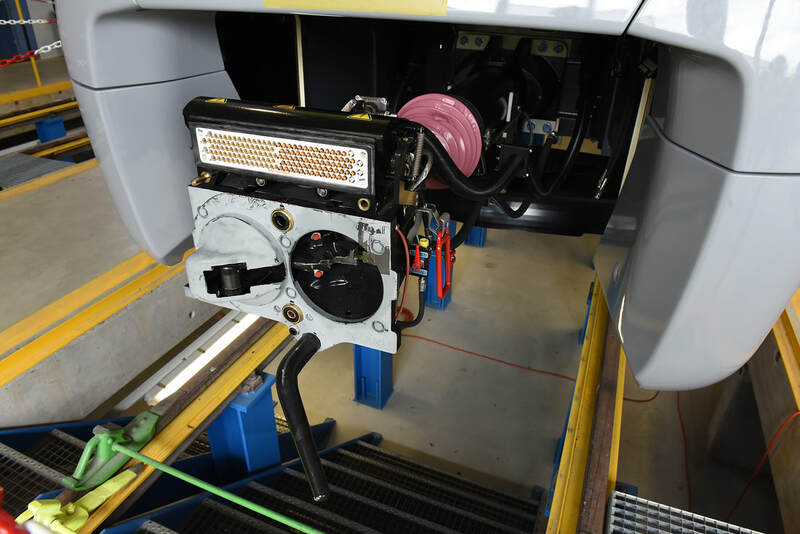 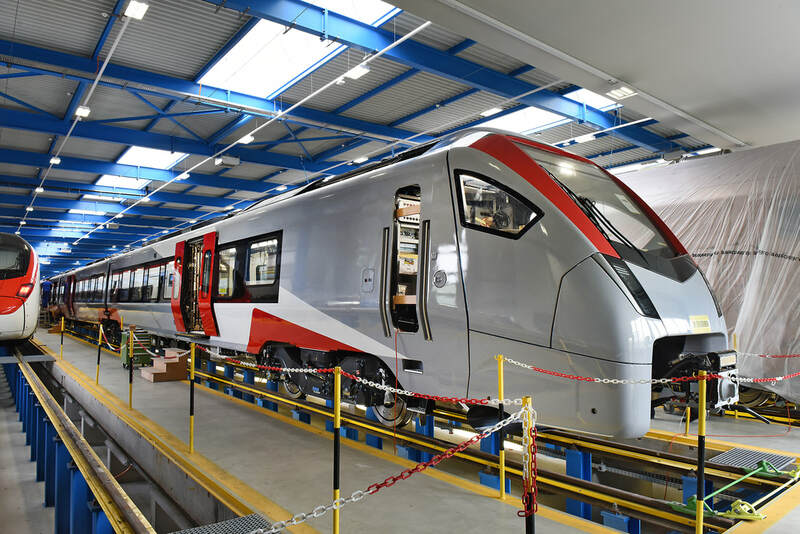 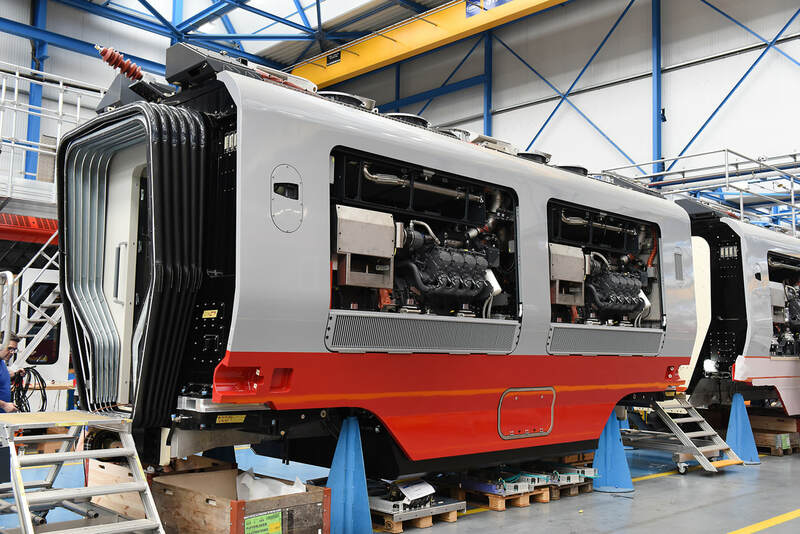 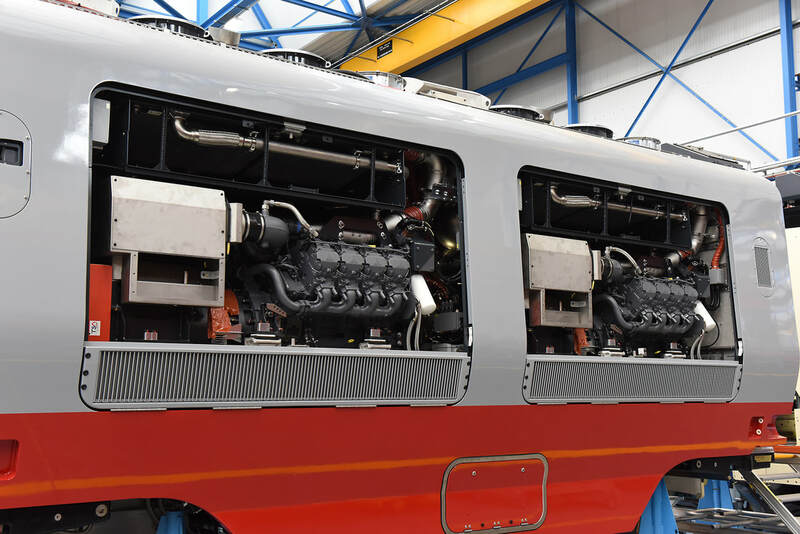 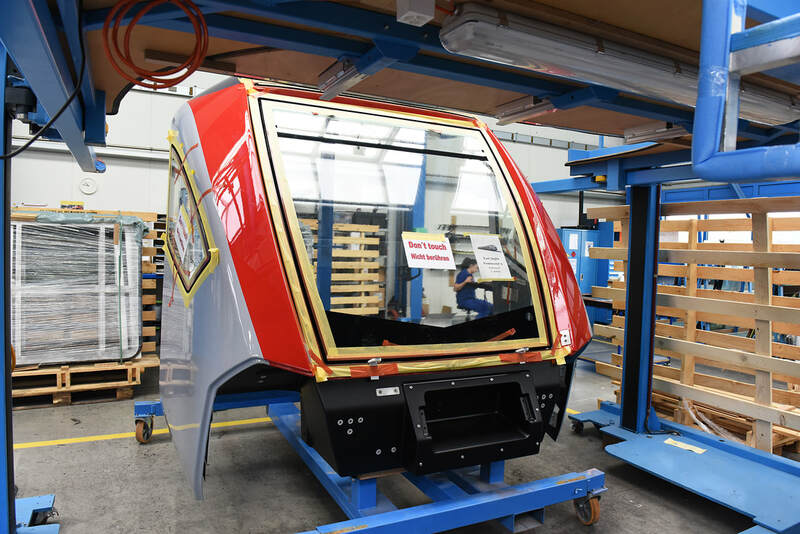 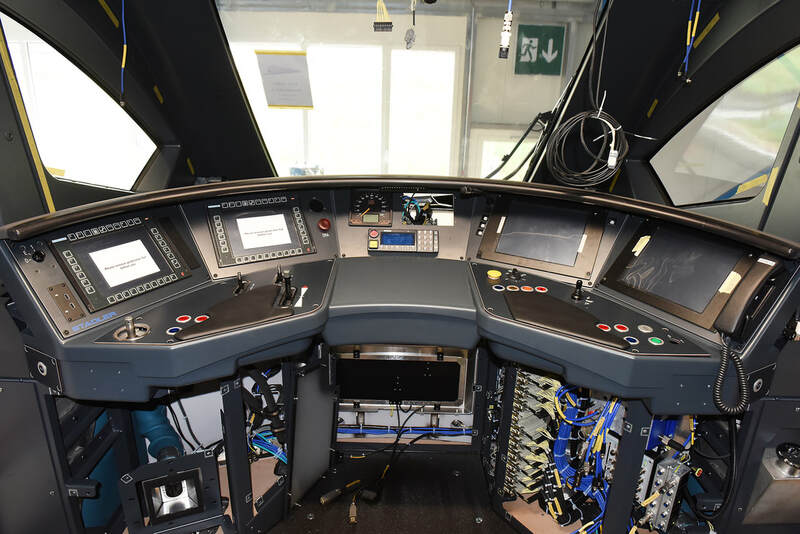 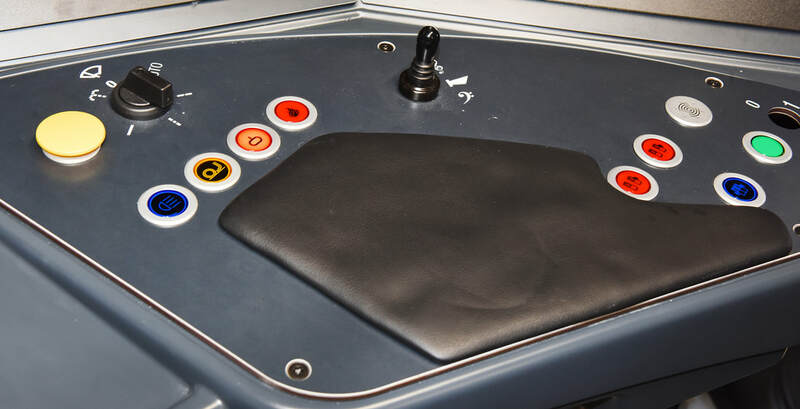 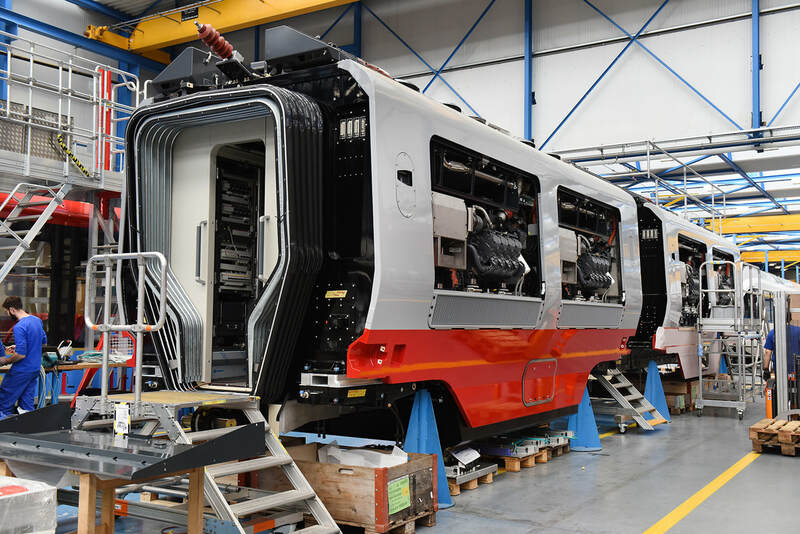 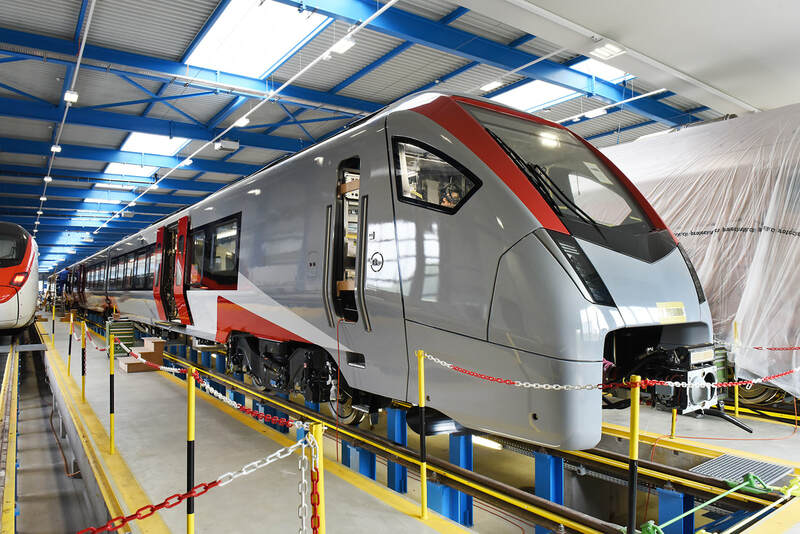 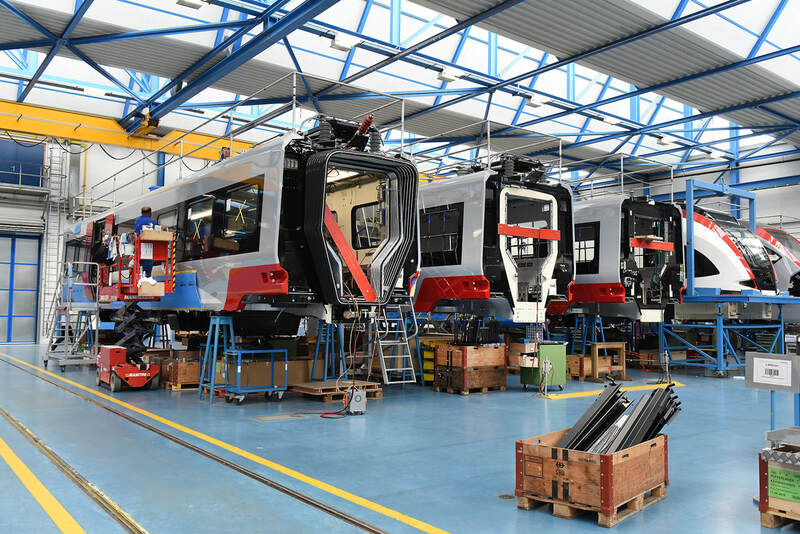 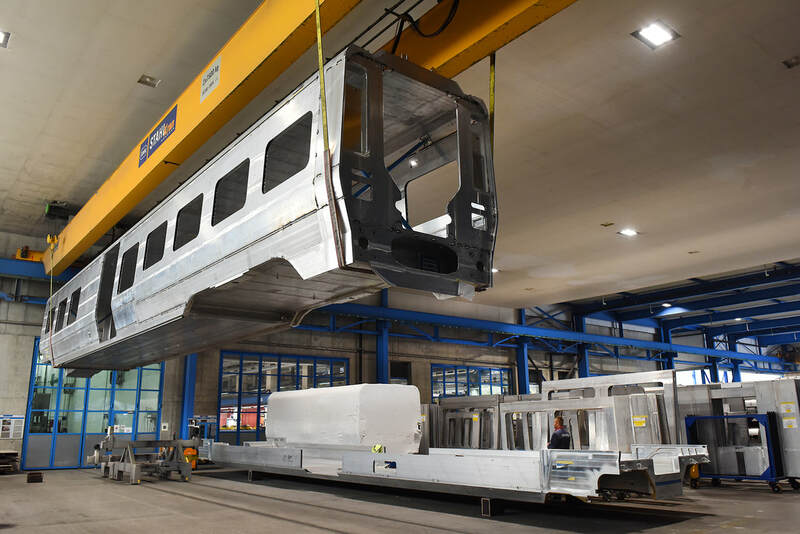 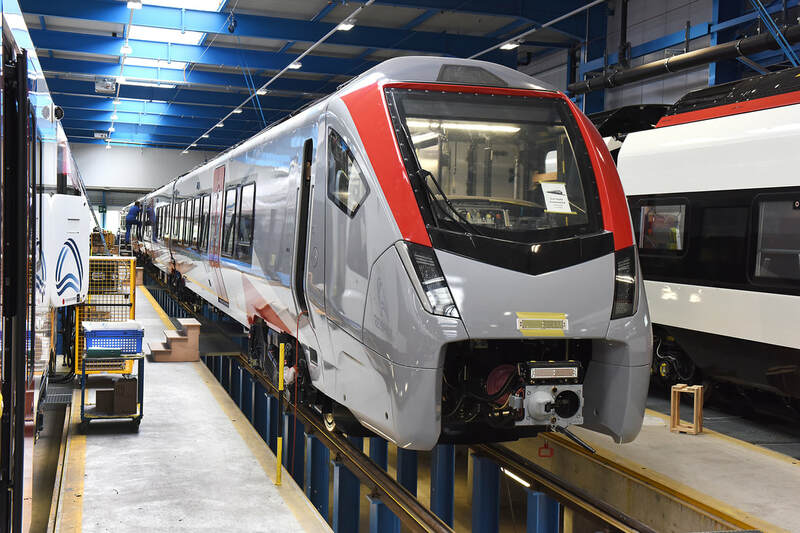 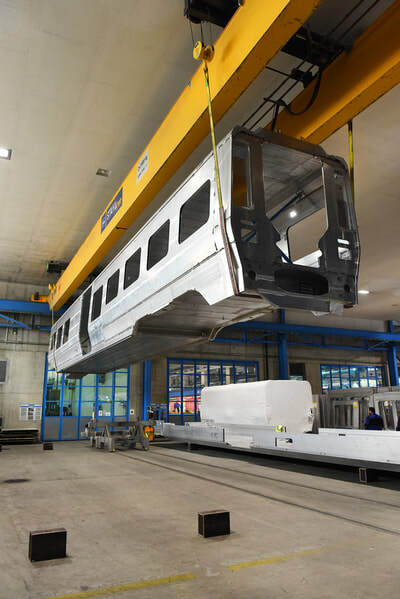 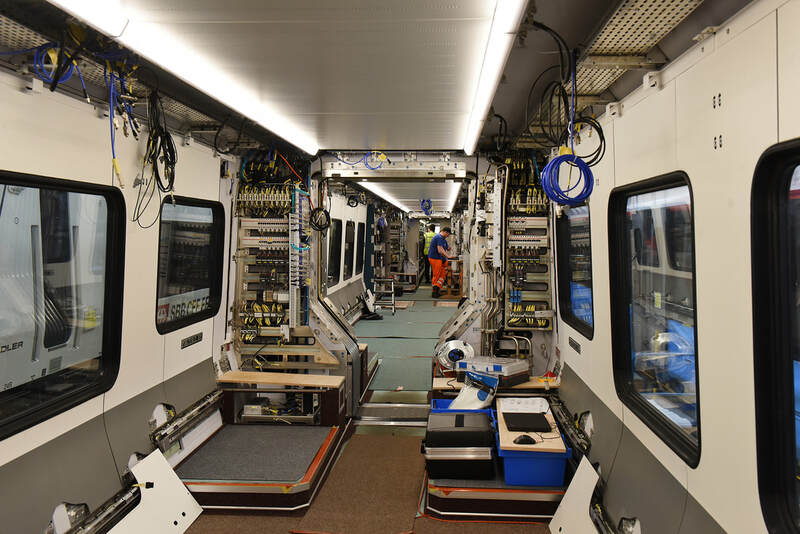 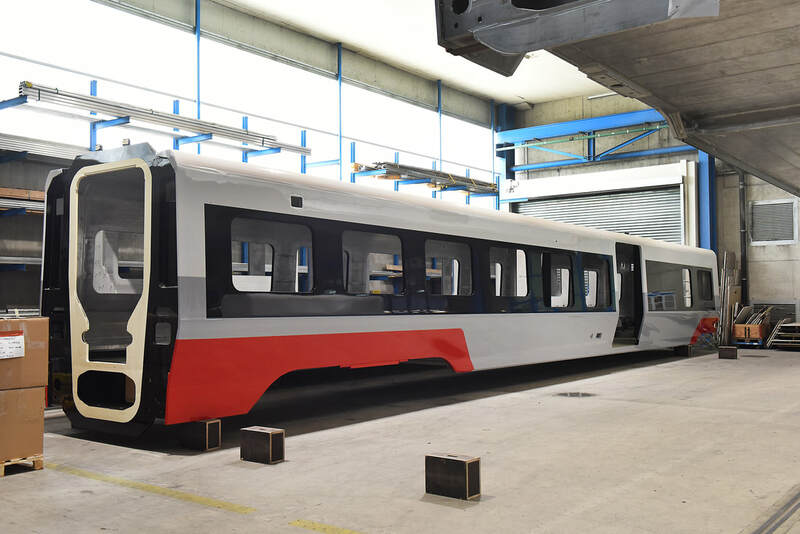 Production of the entire fleet of 12-car electric sets will be undertaken at Stadler's plant in Bussnang, Switzerland, with boy shells supplied from the Bussnang plant of from Szolnok, Hungary. 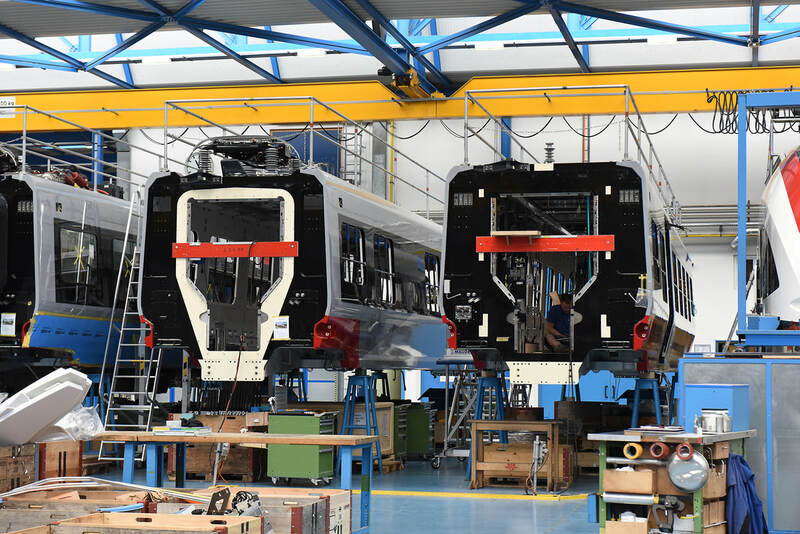 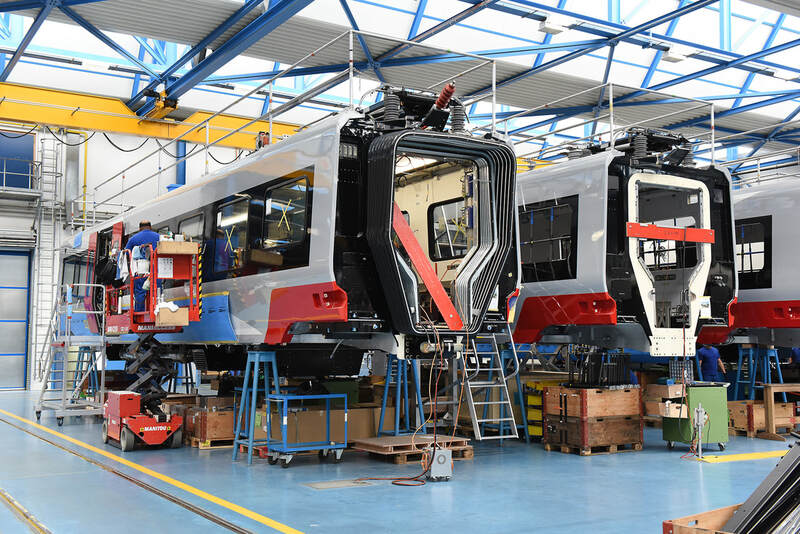 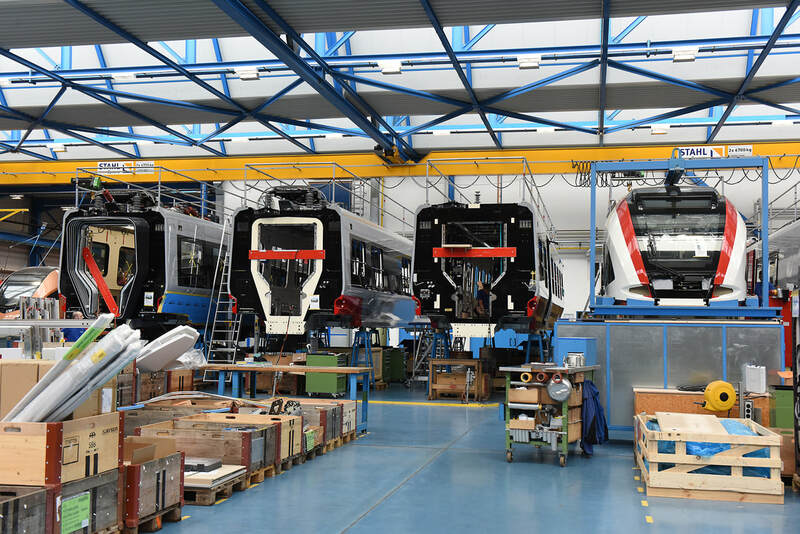 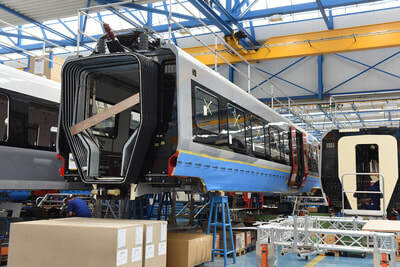 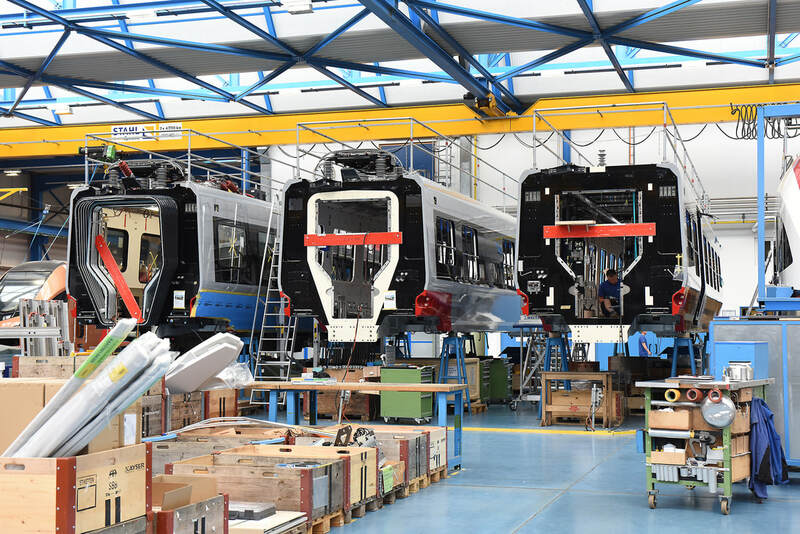 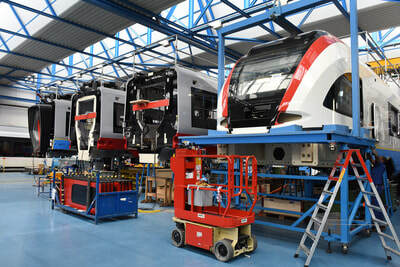 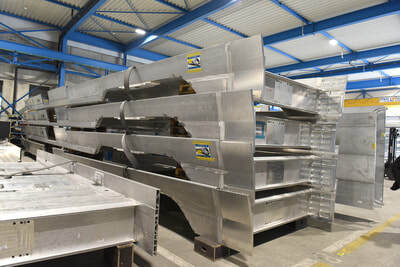 Production of the Class 755 BMUs is split between various works, the first five 4-car and 3 three-car sets will be fully assembled in Bussnang, while the Stadler plant in Siedlice, Poland will be responsible for the majority of the remainder, PP vehicles 9-38 are to be assembled at the Stadler plant in Valencia, Spain. 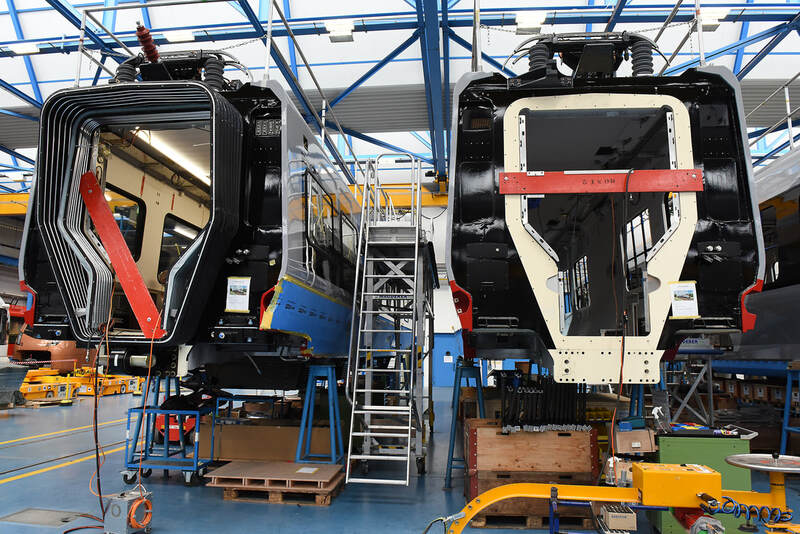 The pictures below were taken by Stadlers plant in Bussnang, Switzerland on 3 May 2018. the first five illustrations show vehicles from a Class 745/0 set, the remainder show Class 755 stock under assembly. the complete set No. 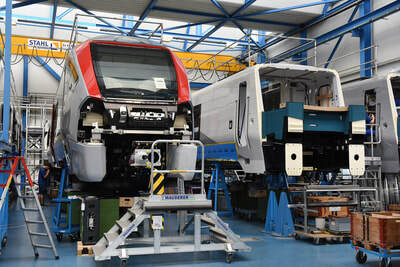 755401 in the bottom five rows of pictures were taken at the Stadler commissioning plant at Erlen.